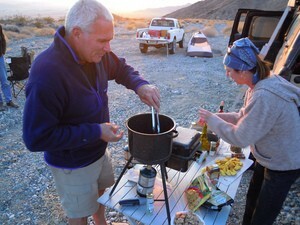 Beyond driving, sightseeing, and relaxing, RV cooking is just about the most important part of the RV lifestyle. What’s the first thing you hear as soon as the RV is parked, the awning is run out, and the campfire is lit? Whether you’re RVing with the entire family or it’s just the 2 of you, the first thing on everyone’s mind is usually when do we eat. For some, campfire cuisine is nothing fancier then hot dogs on the grill, beans out of the can, and maybe a bag of potato chips on the side. For dessert it might be roasted marshmallows, or if you’re lucky, Smores! The rest of us prefer a little more imagination and maybe a somewhat healthier diet when we’re doing the RV cooking. Whether your evening meal is being prepared in a Walmart parking lot or at a luxury RV resort where you’ve set up camp, there’s no reason you can’t cook up good healthy meals when you’re RVing. I tend to lean toward outdoor cooking when we’re RVing — sometimes over the campfire, other times with the propane stove or portable BBQ. One-pot cooking makes RV cooking outdoors all that much easier, and the best pot you can use is a good old-fashioned cast iron dutch oven. When combined with a cast iron skillet and some other cast iron cookware, you will have a cooking set that will last 2 or 3 lifetimes without any indication of wear. This very versatile piece of cookware can be used over almost any heat source. While being rugged and virtually indestructible, its cooking characteristics truly make it one of the best performing cooking implements ever made. Cast iron cookware is very easy to maintain, and food seldom sticks (as long as the pan is seasoned properly). The worst burnt-on mistake can easily be cleaned up simply by putting some soapy water in the pan and heating it up. Like a simmering stew, it will lift and loosen all of the burnt particles. In a few short minutes the pot can easily be cleaned. Once clean, simply wipe your cast iron cookware with some vegetable oil in order to renew the seasoned surface. If you’re lucky enough to find a neglected cast iron skillet at a garage sale, don’t be discouraged if it has a coating of light rust. Take it home and clean it up! Then, give it a good oiling with vegetable oil and it will be good as new. With all these great ways to cook up some fantastic meals, the next thing you’ll need is some recipes that are especially designed for outdoor cooking. These will enable you to take full advantage of your open air kitchen. 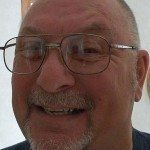 Here are my favorite websites with recipes for RV cooking.